Our focus was for a vintage-masculine birthday card and I think this fits the bill. With Fathers Day just around the corner, this design would work by just changing the sentiment. This is a digital image by Eureka and I merged the sentiment with the scroll design. Hope you enjoy and have a good weekend. 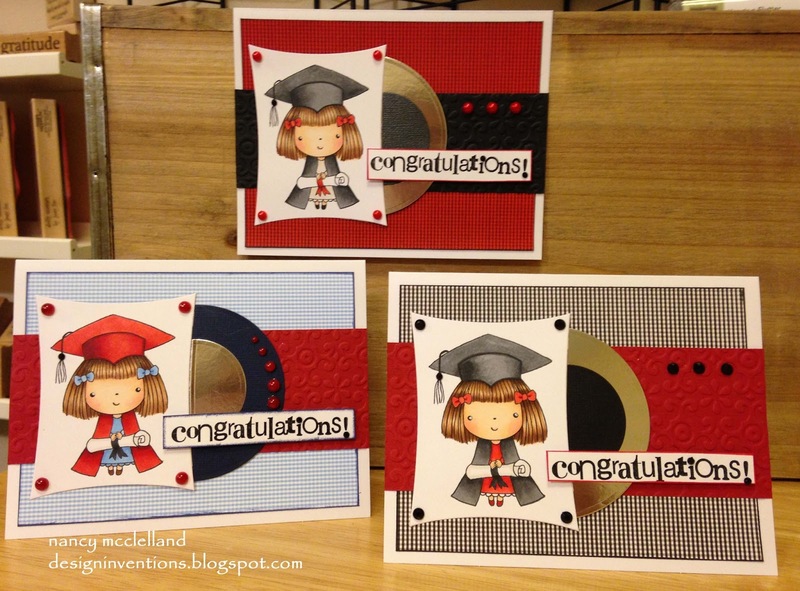 I think this is the last graduation card for this year. Party is not until June 8th but I wanted to get it our of the way so I could put the graduation box away for another year. Pretty simple card. 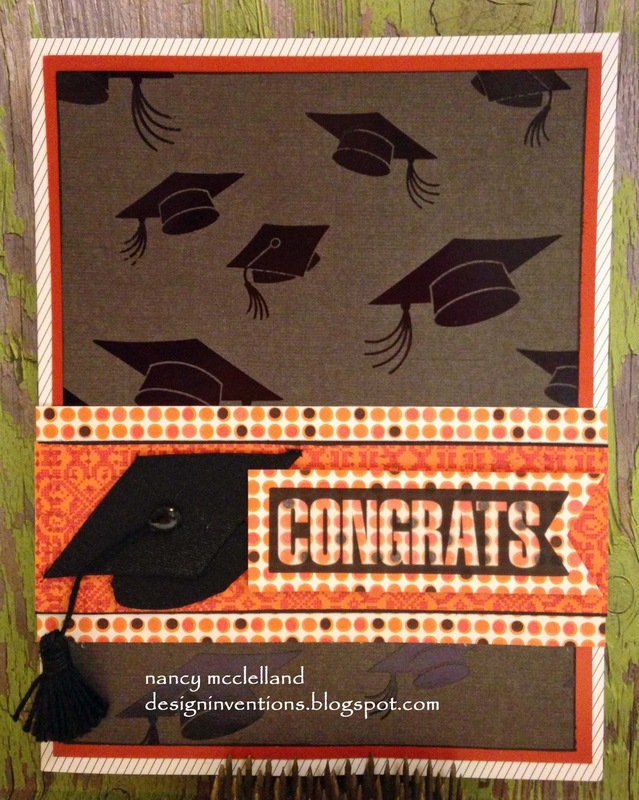 Paper layering, a congrats sticker and a Jolees's graduation cap. Sorry for my short absence, but with my daughter in town and having the new grandson, things have been a little busy. 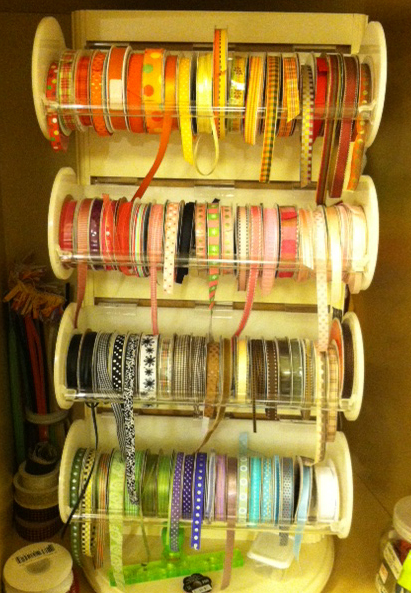 I put my daughter on the plane back to Florida yesterday and finally came down to my craft room. I did a little cleaning and here is the product of that exercise. 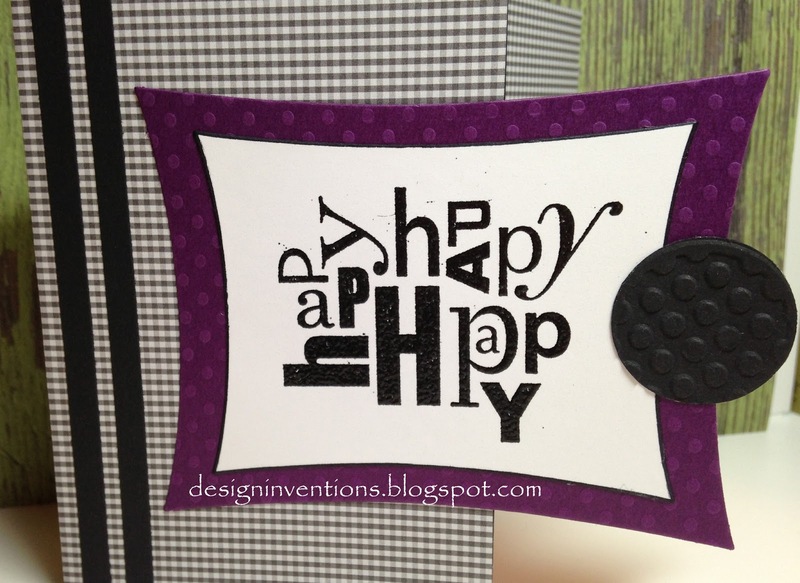 These two cards have a little dimension and incorporated a couple of experiments that I was working on. Not real fancy, just basic cards. 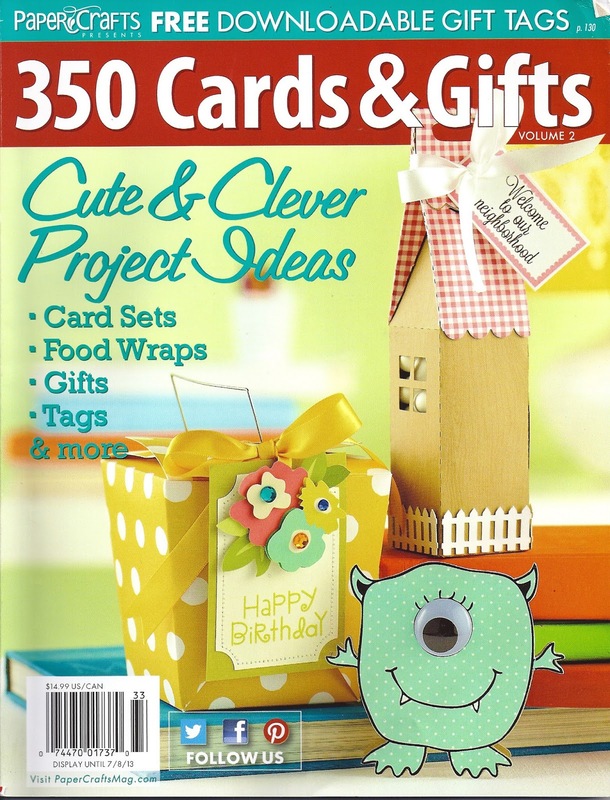 Do You Need A Craft Fix? For those of you who know me, I was one of the teachers at All About Pictures and I’ve gone through withdrawals since its closure. Our sources here in Cedar Rapids are limited and I miss having the opportunity to network and share with everyone. 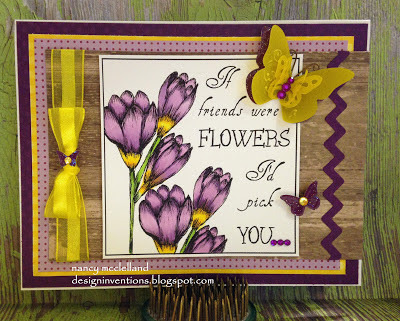 So with that said, are you looking for an outlet to spend time with fellow crafters and get some cards made, scrapbook pages completed, work on that sewing project or any other craft that you want? Well, I have an offer for you. I have a building with plenty of space and we are going to start meeting in June. 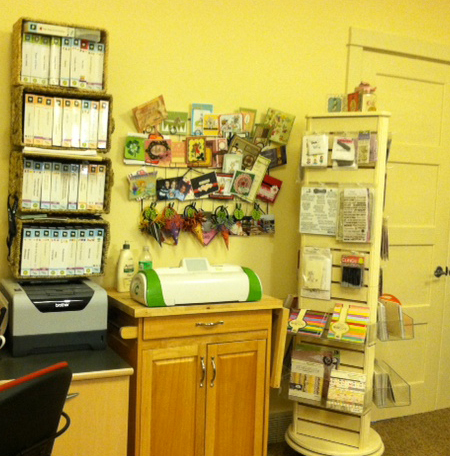 AAP used my facility for the Card Camp last fall and the space worked very well. I will put up tables and chairs in my open area that accommodates about 20 people. 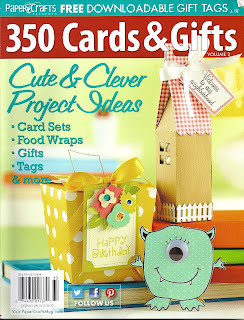 There is a possibility that I can have a Cricut, BigShot and a few other items that would be available for your use. 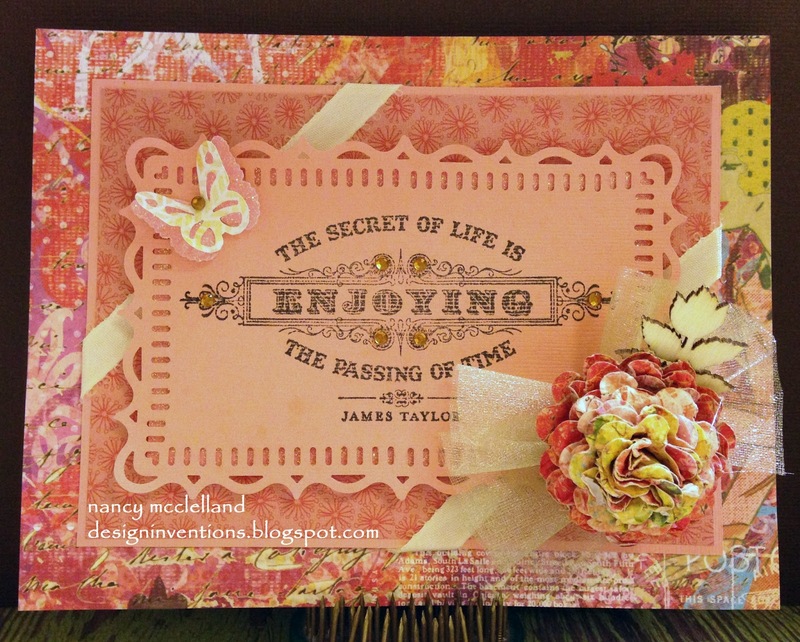 I will also be offering several Amuse Studio Workshops during the month, (dates listed below) where you will make several cards and be able to see the products that Amuse offers. If this has sparked your interest, please let me know by sending me an email and I will send you all the details. Well so far this year we only have 4 graduation parties to attend and 3 of them are for girls. This is Penny Black's Graduate Mimi (4264J) and I wanted to use this stamp last year, but I only had Boy graduates. 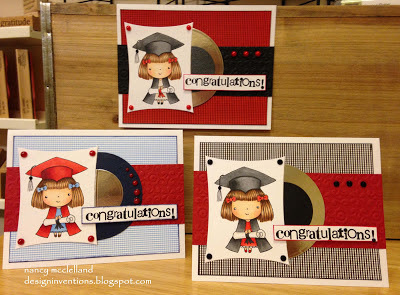 So today I'm featuring my 3 cards for the girl grads. Now off to work on the card for the one boy this year. It's time to take a peek at the June Spotlight selections. 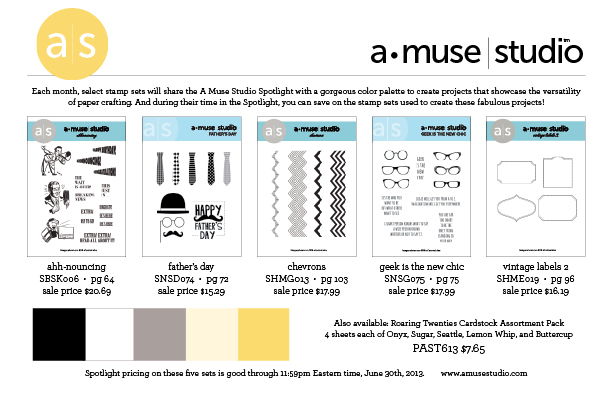 Fun ideas for Fathers Day and a very cool color palette. 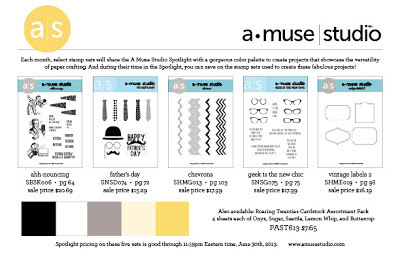 Go to Amuse Studio and take a look around or just email me for more information. It's Greeting Challenge Day over at Outlawz. This is my first time hosting the challenge since my DT assignment. 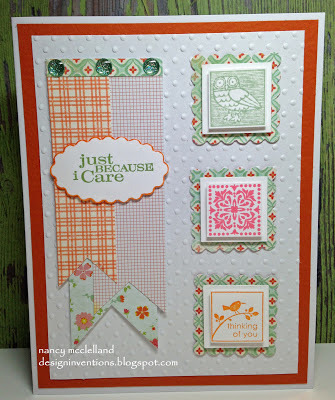 Here are my cards used for inspiration, but go on over to the site and see the other DT's creations and join the fun! I received my package from Penny Black yesterday, and this is one of the stamps I got. Isn't he just so cute! 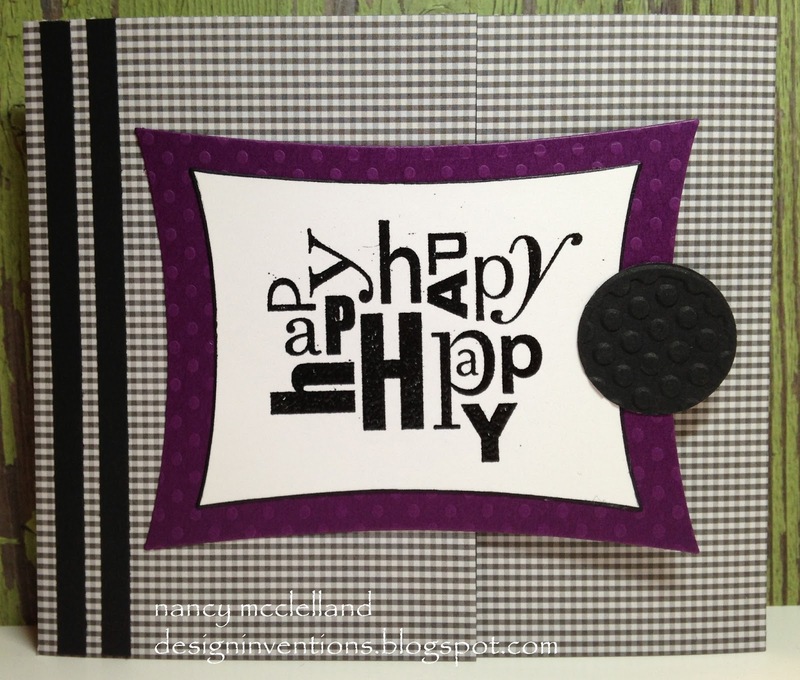 The card is a scallop circle that opens on the left side. Layering a few more circles and then the colored image. 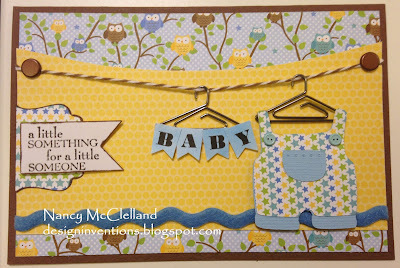 The paper is from American Crafts - Hip Hip Hooray. 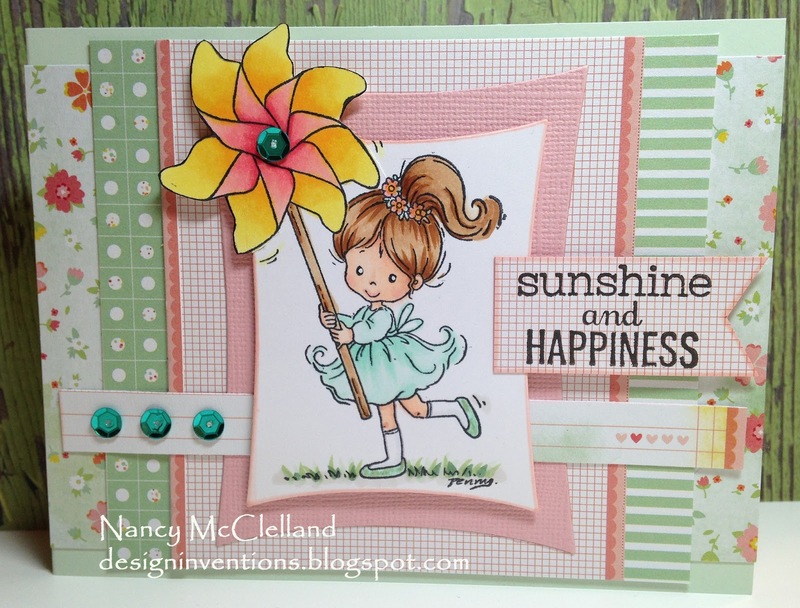 I hope you enjoy this little card and have a Great Day! 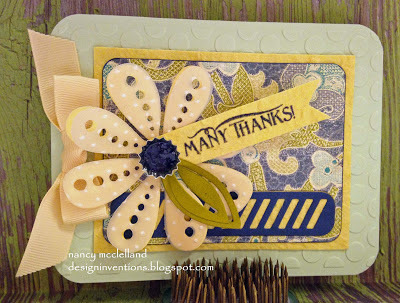 Today I decided to just play around with a few items that are laying around in my craft room. I started with the paper flower that I actually made about a year ago. Then I went on a quest to find the left over scrap paper that matched. Well, surprised, I found it. 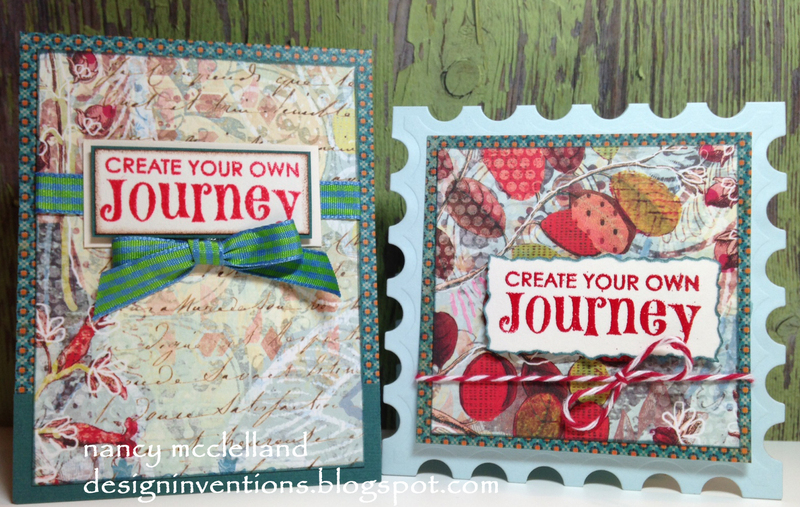 The fancy shape in the center is from a Martha Stewart punch-around -the page punch. I added the sentiment, misc. embellishments and there you have it. 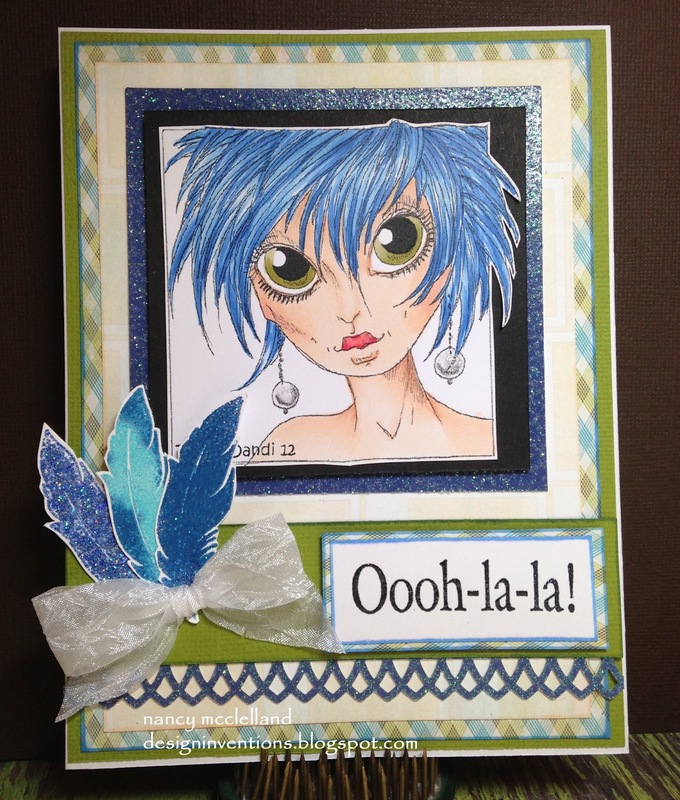 Here's a fun card that I made using my Copic Markers and my airbrush.. 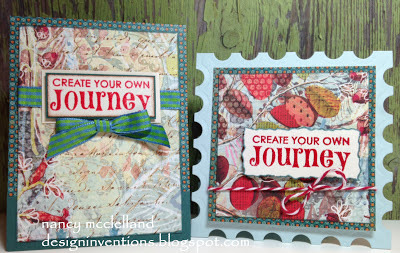 I featured this process last week on another card and this weekend I was using some more of the papers that I had already created. 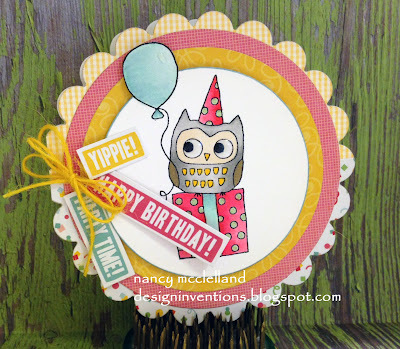 It was fun to add layers and fun punch designs. This is my Design Team entry for the week. Go over and enter some of the challenges. There's something for everyone. 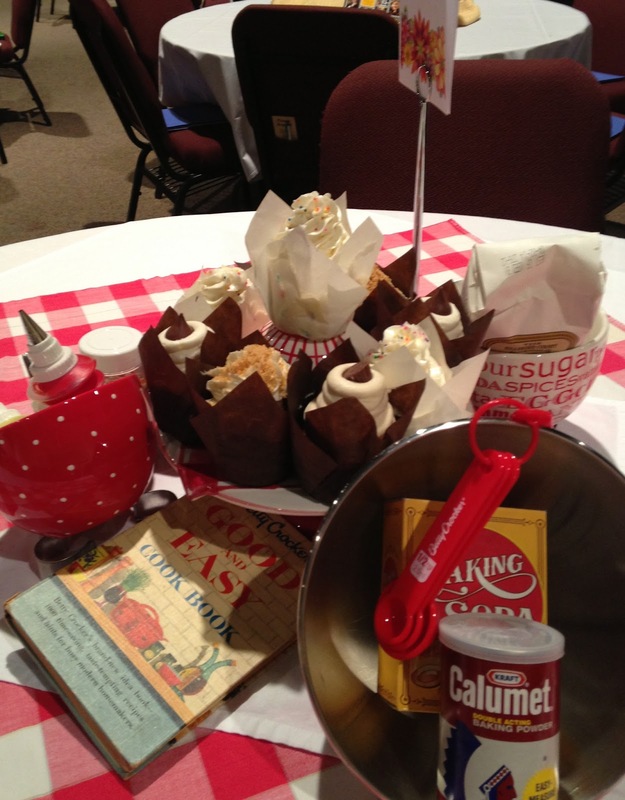 Some of you may know that my church helps sponsor a brunch every year the Saturday before Mother's Day. 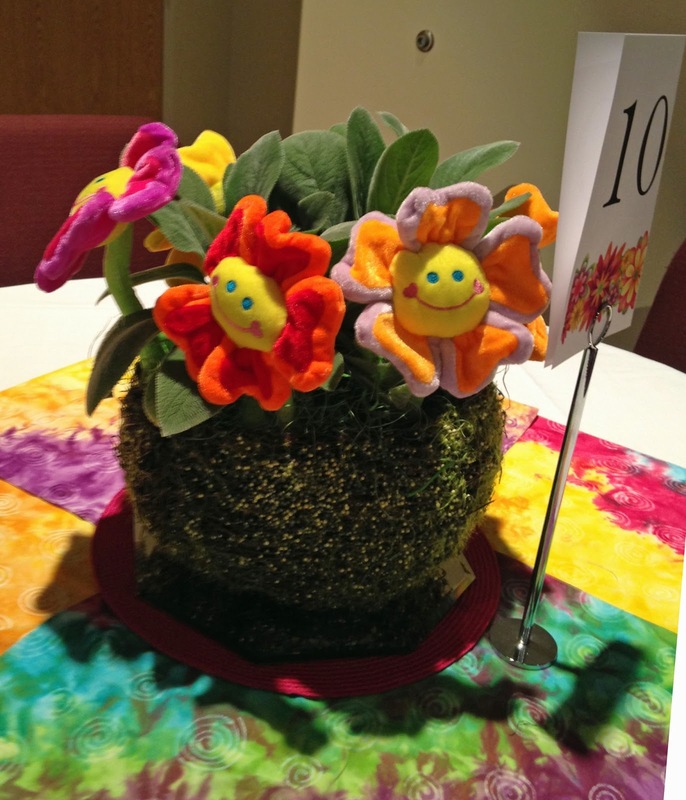 There are about 35 tables set up and then we all volunteer to decorate the tables with a theme. 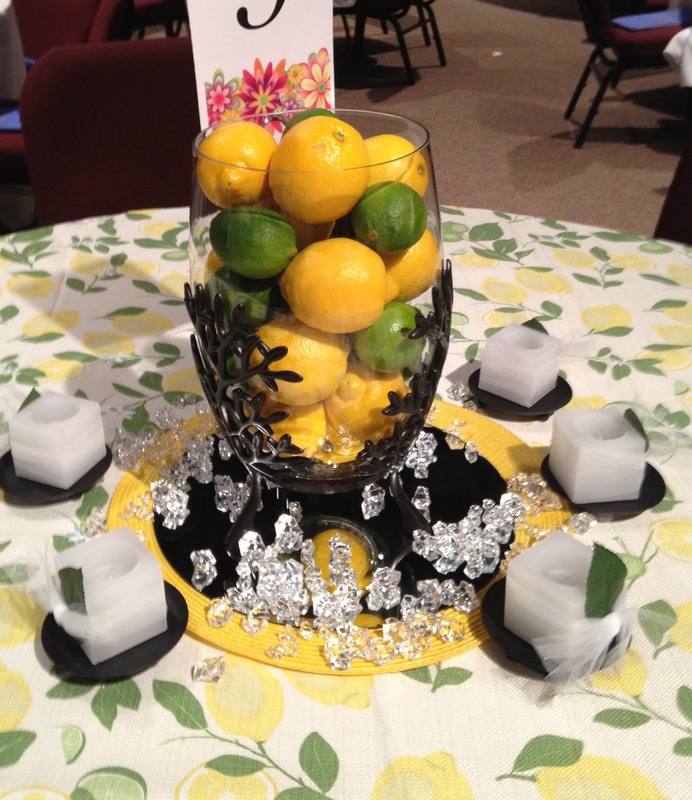 In the past the decorating involved a center piece and a complete table setting for 6, dishes, silverware and glasses. Well thankfully this year they changed it up a little and all we had to do is provide a center piece. So much easier on me since I usually have the task of 6-8 tables. I'm home, linens in the washers and stuff put away. This usually takes me over 4 hours and I did it in 1 hour. Well with that said I'm going to share what I did. Pictures were taken with my phone, so hope you can see everything OK. 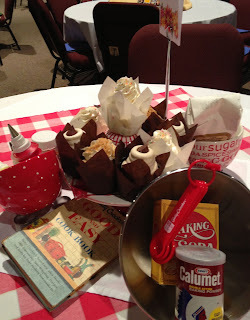 This was a baking theme, no I did not make the cupcakes. I got the green container at Gordmans, where I work and it was so inexpensive. I put some real fuzzy like flowers in it along with these crazy $1.00 store smiley flowers. Oh, so colorful. 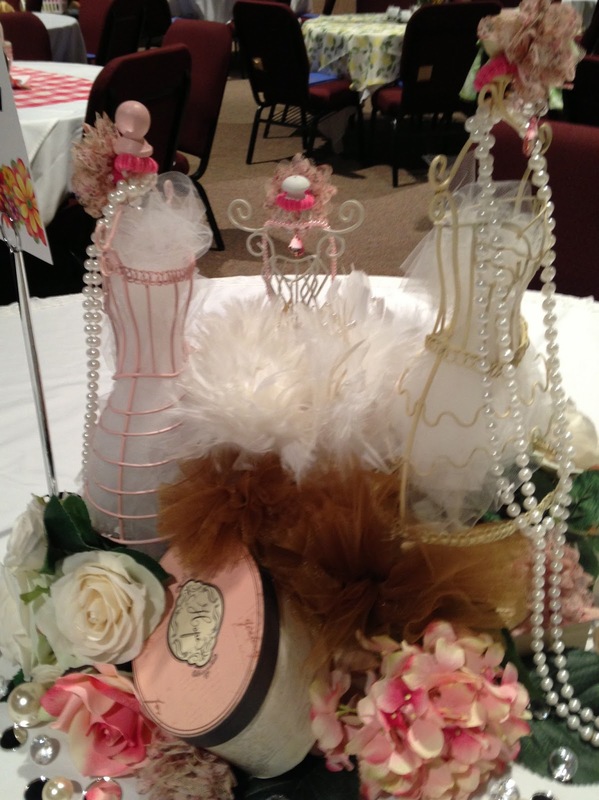 This is a sweet, girly table. Wire dress forms, feathers, beads, pearls and netting. All pink, which is really not me. Lemons and Limes. This is simple and always looks nice. I found the table cloth at Kohl's on sale for $6.00. It really made the table. 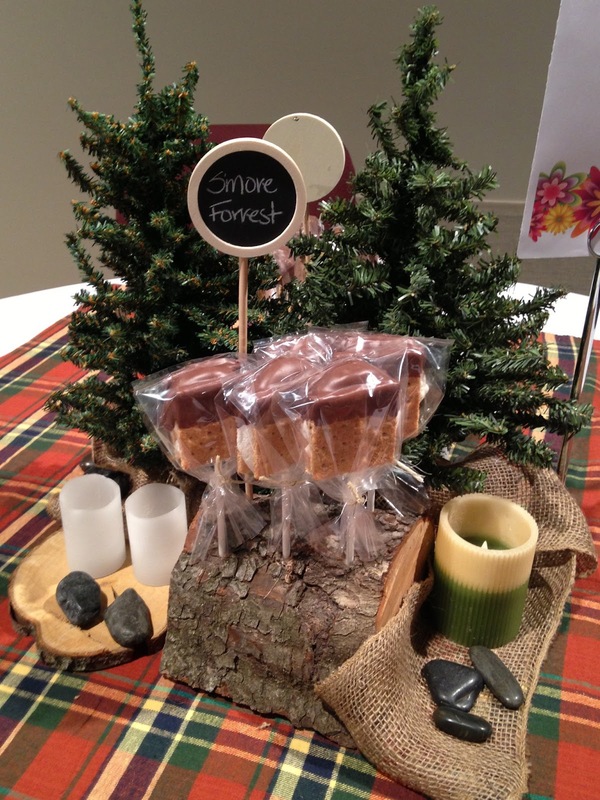 S'more Forrest. This theme was borrowed from my daughter-in-laws baby shower. The log bases were made by a friends husband and he drilled holes in the top for the sucker sticks to go into. Who doesn't have a few small xmas type trees, add some burlap, rocks and a candle. Oh, and of course, S'more Pops. 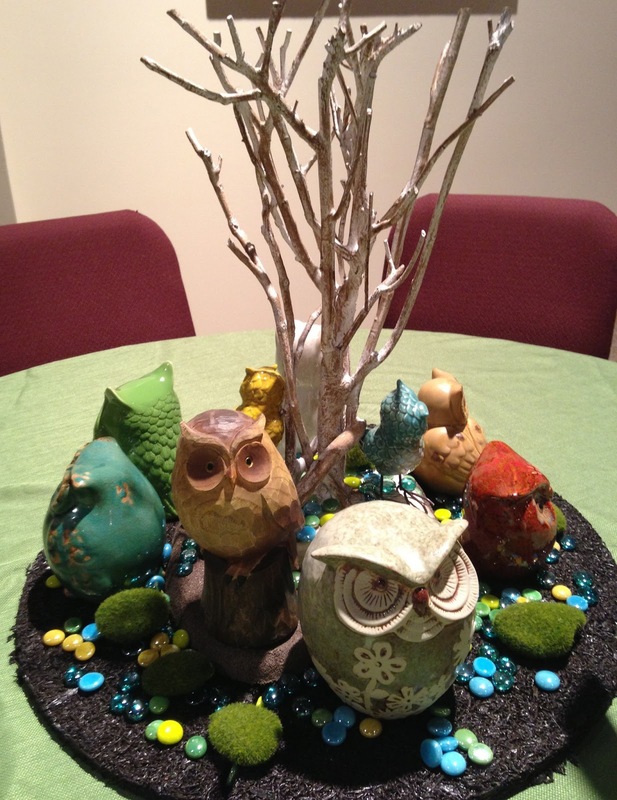 The Wise Owl table. Little did I know that this would be the table that was a hit. Owls are very big right know and fortunately we have zillions of them at Gordmans. Believe it or not the base started with a rubber tree ring (the fake mulch), then I layered a flat synthetic walking stone over the tree hole. Put the birch tree, decorative rocks and the Owl's. I think I have 9. 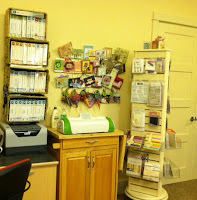 Ok, so now back to my craftroom. Enjoy you weekend. I saw a sketch someplace that gave me the inspiration for this card. 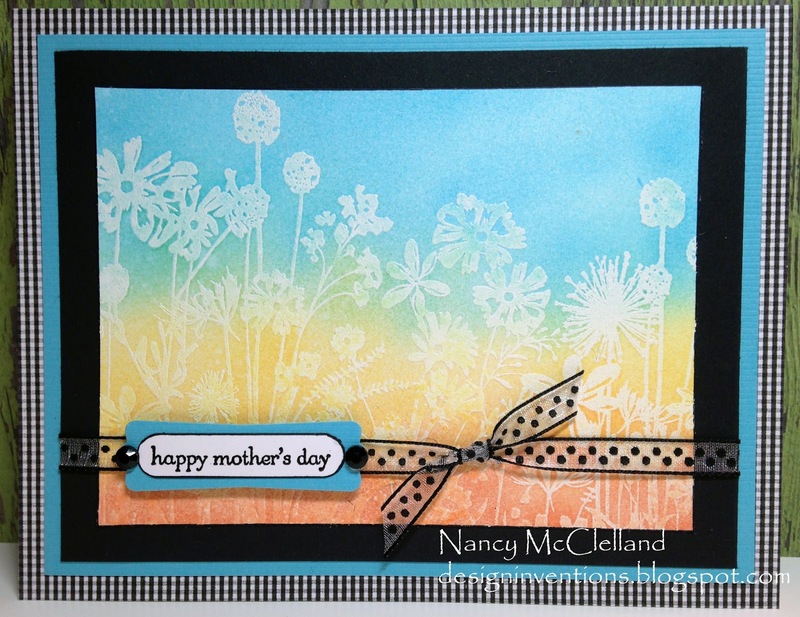 I've used variations of the sketch and just portions of it on many cards. 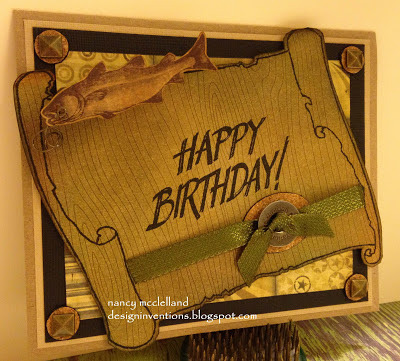 Good way to use up scrap papers. 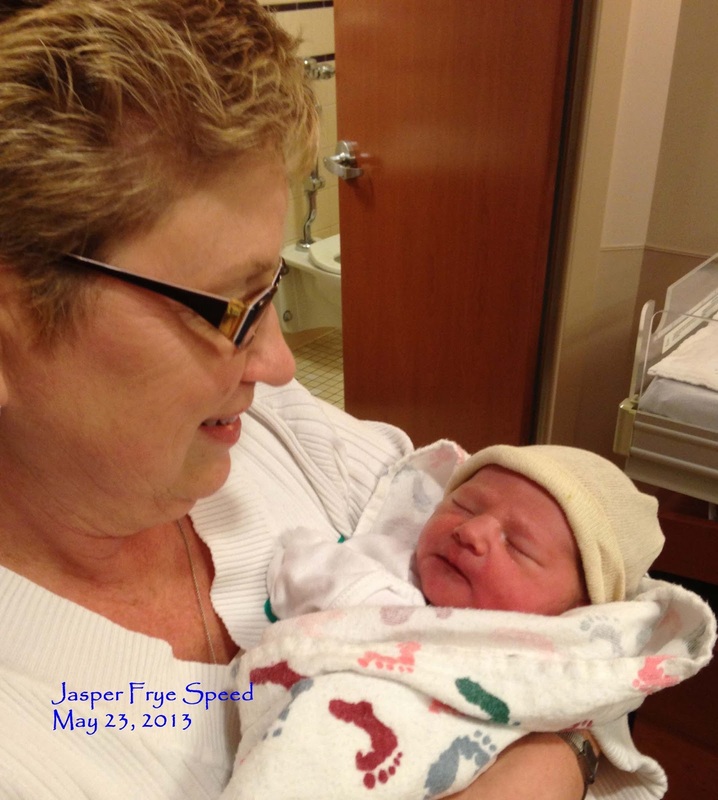 Hope everyone has a great weekend and a Happy Mothers Day! I picked this magazine up yesterday and as usual I was not disappointed. 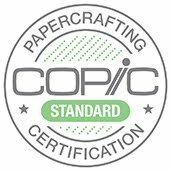 PaperCrafts is one of the regular subscriptions that I get monthly and I usually purchase their special editions like this one. I found mine at my local JoAnn's. 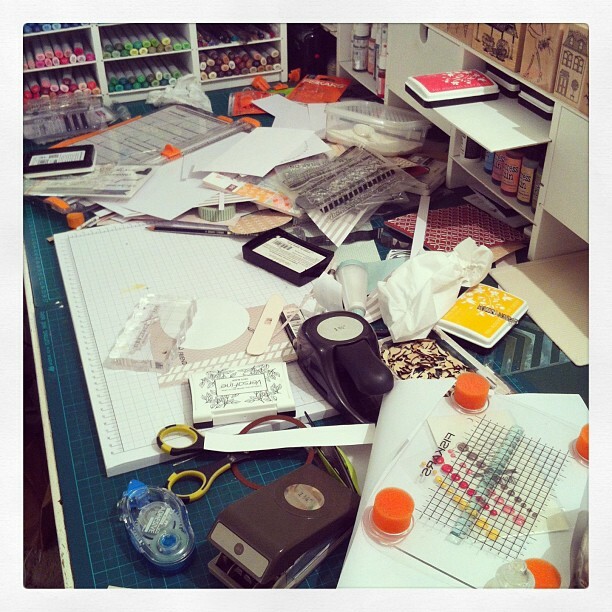 I got an email from my sister last night showing me a view of a bloggers desk space after the creation of a card. Well if you are like me, you can completely relate. I have a total MESS! So today I did a little clean up and made these 2 cards. 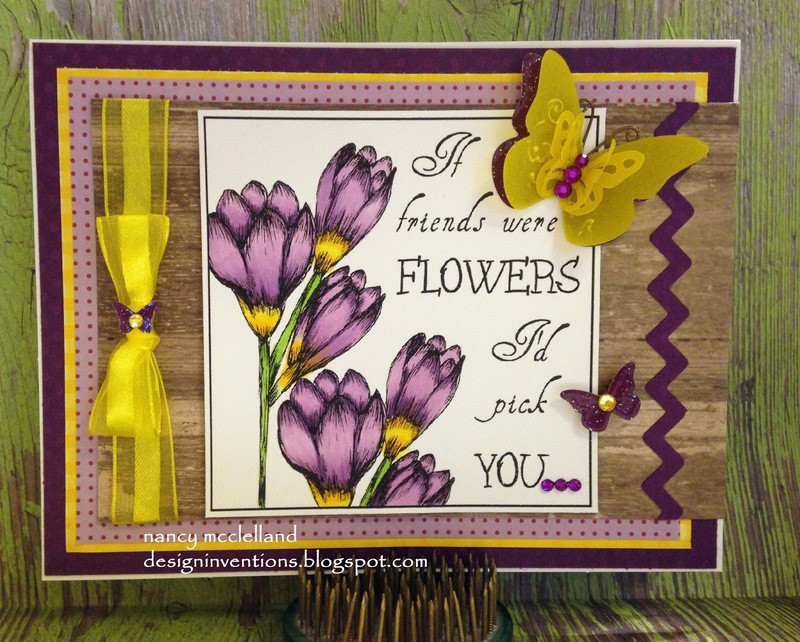 Simple and inspiring for about any occasion. So Bills birthday is today and this is the card I made for him. 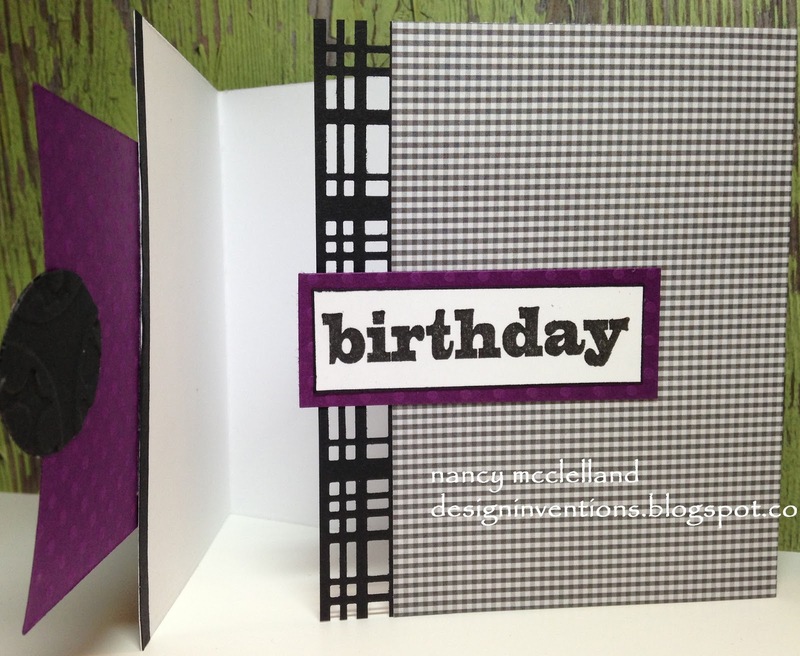 Very simple center fold card. 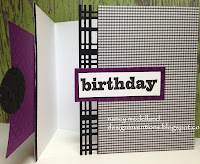 I used a simple black and purple color scheme with a few accents. 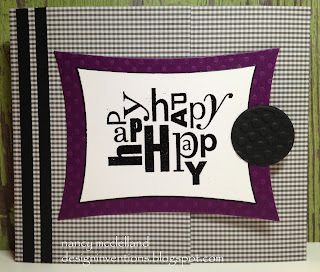 This is the right side of card as you open. The Birthday sentiment is totally hidden from the front when it is closed. Thanks for sharing in my Husbands special day. This was a fun card to make and the inspiration came from another blog that my sister and I follow. 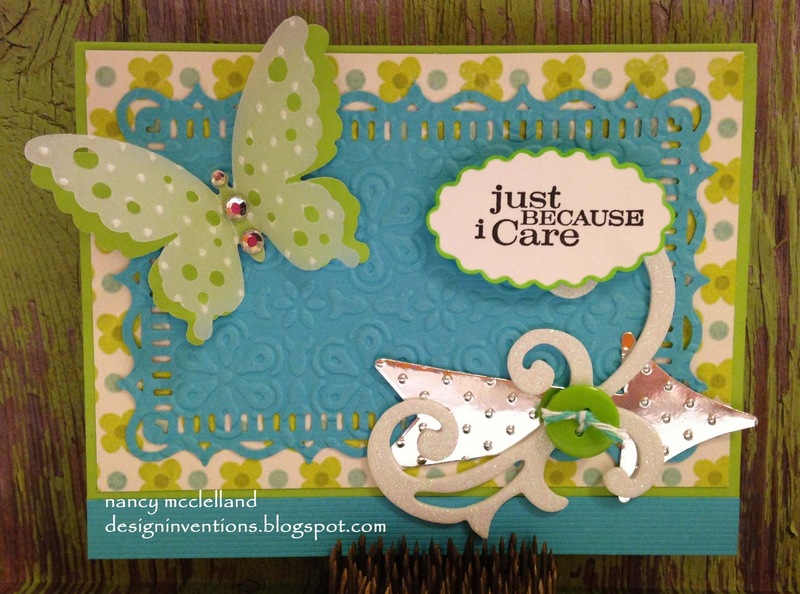 I stamped the image on white cardstock and embossed with white powder. I used Copic Markers and sprayed several colors over the stamped design. Then I sprayed Colorless blender over the entire image and as you can see the Copic color has vanished and you have a very soft blended background. 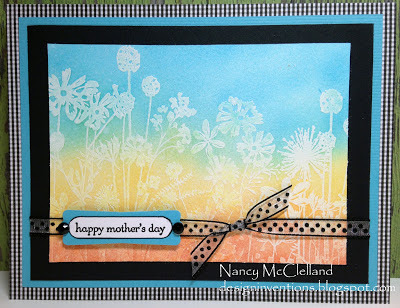 I blotted the front of the card with a towel to remove some of the ink that was sitting on the white image. You can spray as little or as much as you like. Give this technique a try. I want to share this card today because we are getting close to Mother's Day on Sunday and we should all have those special people in out thoughts this week. My daughter-in-law still has not had her baby, but I know she is excited to celebrate her first Mother's Day. 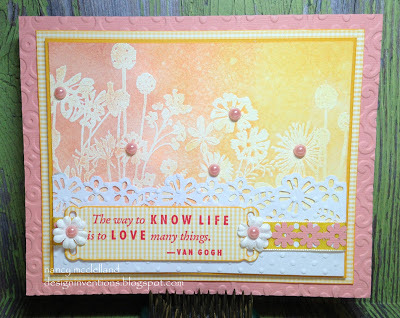 The card for today features the Madeline Collection from Prima. (found at Hobby Lobby). I had a special stick pin that I wanted to use and this paper was perfect. I used an old sentiment that I had on file and made a copy from the computer. I hope you enjoy and thanks for stopping by today. Good evening, I hope everyone had a good weekend and you're rested for tomorrow. 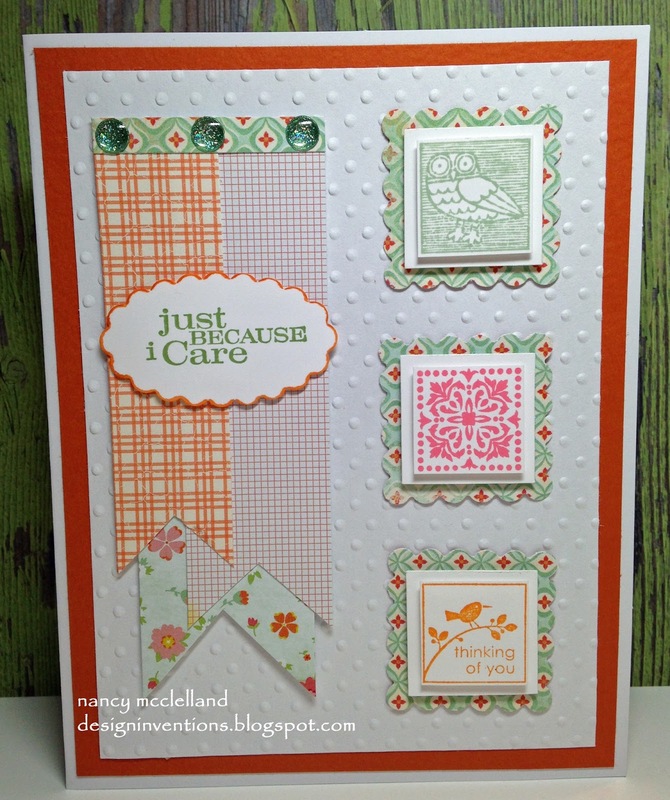 I've been working on a few projects this weekend and got a couple of cards put together. 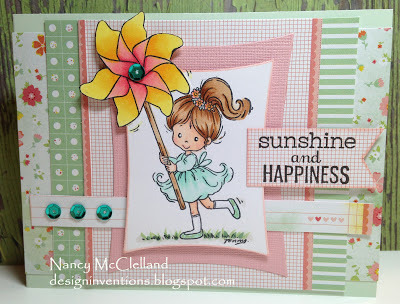 This fun little image is from Stampavie and she makes me smile with here sweet face and pinwheel. 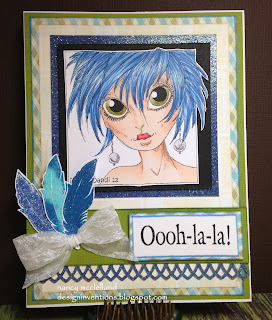 Simple image to color and just a few sequins to add the bling. On another note, I want to share some fun news with you. We have weekly challenges with prizes, lots of cards for you to look at, with something for everyone. Go to the website and look around. There are many talented people there and a good place for ideas and inspiration. 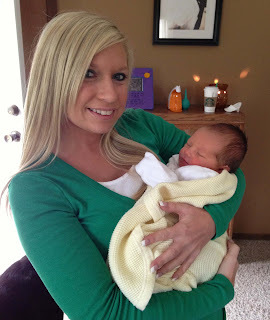 Well this weekend is the last baby shower for my daughter-in-law. We are on the final few weeks and that special little guy will be here. This card has a little something from everywhere. A little Cricut, Tim Holtz-Ranger, Copic Markers, EK Success punches, Stampin Up, Doodlebug Designs. 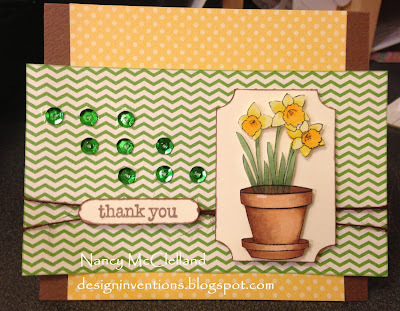 I have 2 more cards to get done for special little gifts, so tomorrow will be a busy day. Happy May Day everyone. 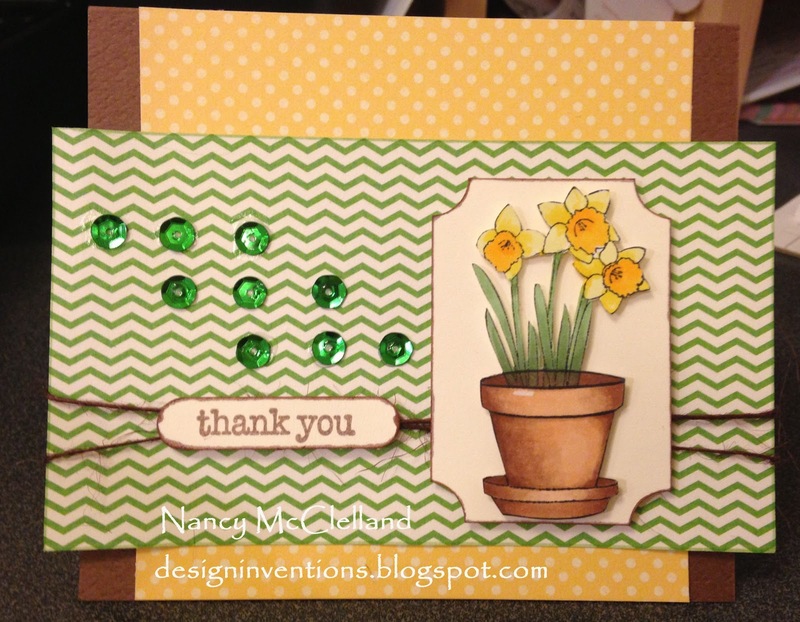 This is an oh so simple card and a tribute to my sister. 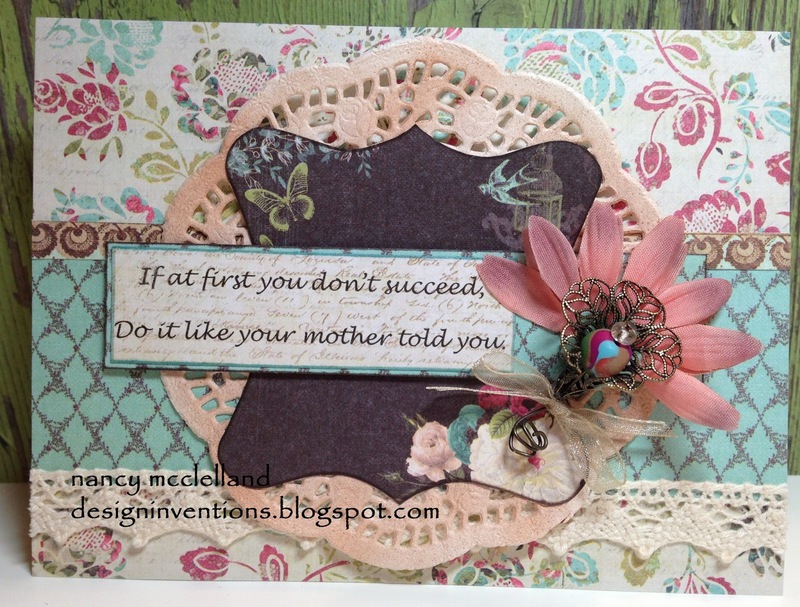 She is just as crazy about card making as I am and she has been on the sequin path over the weekend. I decided to join her, so I put a few on this little card. Usually we can say that April showers bring May flowers, but hear in the Midwest we are bracing for May SNOW. How silly is that? Today is till nice for us in eastern Iowa, so carry on I guess.